My father started giving me shots of insulin in 1945, when I was 6. When the needles were dull, he sharpened them with a "whet rock". We had our own well, and there were lime deposits from the rocks underground. The needles would be coated with these deposits after they were boiled, and they would occasionally become clogged. The opening in the needles was wide enough that we could push a very small wire through and unclog them. When the needles and glass syringe were being sterilized in boiling water on top of our kitchen stove, we would sometimes forget about them, and all the water would evaporate. Then there was a loud pop and pieces of glass would fly all over the kitchen. I don't think we ever got hurt by these flying pieces of glass, but it was a potential danger. Fortunately, we always kept a spare syringe on hand. 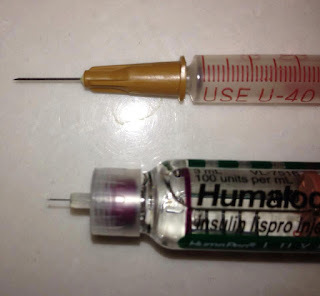 The picture shows a comparison of a 3/4 inch long 26 gauge needle attached to a glass insulin syringe, and a 5mm 32 gauge (5/32 inch) pen needle attached to a Lilly Luxura pen. What a contrast when we compare the 1940's and the present day! I used the 3/4 inch needle during my early years. My doctor had my father inject into my leg or arm muscles at a 90 degree angle. I was skin and bones when diagnosed, so the injections were very painful. It was not necessary to push the entire 3/4 inch needle into my muscle, but most of the needle was necessary to get the needed absorption. Injecting into the muscle caused the animal insulin to be absorbed more quickly. The insulin from pigs and cows was not as fast as the fast acting insulins we have today, so having a faster absorption was helpful. In my early years I had only one injection per day, before breakfast. The animal insulin was a 24 hour insulin. In 1955 there was concern about the infection caused by the use of glass syringes, and the first plastic disposable syringe called the Monoject, was introduced. Unfortunately, doctors thought it was safer to reuse glass syringes after sterilizing them. In 1956 the plastic disposable syringe we use today was designed. Becton Dickinson did "extensive development trials and tests and in 1961 introduced its first plastic disposable syringe, the BD Plastipak." I was still using glass syringes and long needles from 1945 until the 1960's when disposable needles and plastic syringes became available. There are so many things about my diabetes past that I took for granted back then. I tell recently diagnosed diabetics about my past, and some of them look at me in horror and disbelief. I remember these things like they were in a movie, and then it dawns on me that I actually experienced all this long ago. It's funny that when I went back to work in the UK in the 1980's and that was after 20 years of T1D at that time ... the government medical plan there did nt cover disposable syringes. 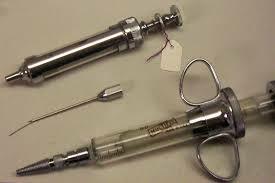 .. what a shock to be introduced to glass syringe and needle that looked like it wasn't for human use. My Dad sent me a care package while I was living there of one pkg or 10 BD syringes. .. what luxury ☺ Like you say Richard when we tell youngsters about what we used ... it's funny to see their mouths gap open !